As someone who has accrued my fair share of air miles (in the last three months alone I’ve flown the equivalent of a lap around the equator) I’ve learned what in flight essentials are necessary to keep me from going crazy. A long haul flight can be brutal, and can seriously make you so bored and tired that you can’t even enjoy the destination when you get there. By appropriately packing a carry-on bag with your long haul flight essentials you can make flying a breeze, or even enjoyable. The big secret is NOT just to fly on first-class on the fanciest airline (though of course that can help – read here to learn more). I’ve flown on the best and worst airlines, but with careful packing any of them can be made significantly better. Oversized cardigan or Sweatshirt– I always pack a cardigan or a pullover hoodie on flights. They are perfect because they are less bulky than a coat and they work with just about any outfit. They can also double as a blanket or a pillow if you don’t have a travel pillow. Book(s)- Reading this, this book. Love them both. Leggings by 90 Degree – If you are someone who gets cold on planes and are traveling in the winter I recommend getting the fleece lines leggings by 90 Degree. They are seriously the best warm leggings for winter travel. Tip for long haul flight outfits – If you aren’t a huge fan of yoga pants I recommend these lightweight, fleecy joggers with a wide drawstring waistband. They are the kind of pants you never want to take off. Super comfortable for flying. Here is the sweatshirt to go with it! Compression Stockings – You will definitely want a pair of these if you are looking for some long haul flight essentials. My husband just got back from a trip to Toyko where he did not where compression stockings and slept 10 hours straight. Let’s just say his legs were more than a “little” swollen when he got home. Fuzzy Socks (The best flight socks) – Also my daily staple. Dr. Jart+ – Water Replenishment Cotton Sheet Mask – My skin got so dry after moving to Las Vegas. When I travel it gets even worse. Any kind of face mask feels like pure heaven when you are traveling and tired. Detox Dry Shampoo – This can really come in handy when you are flying overnight and land in the morning and then go all day. We do that on just about every international trip we have taken. Thank goodness for a good dry shampoo. What are the best noise cancelling earplugs for sleeping on a plane? This is a definite must and these are some of the best earplugs for sleeping. Even though I use my Bose noise cancelling headphones for most of the flight if I want to lay my head sideways and sleep I have to take them off. So these are great to have so that you can block out the noisy plane and get some sleep. I linked some of the best earplugs for sleeping/snoring below. You have a few options. Some people prefer the silicone earplugs because you can mold them to your ear and they do not stick out. This comes in handy if you are going to be laying on your side. If you want earplugs for snoring, traveling, sleeping etc. I recommend Mack’s Pillow Soft Silicone Earplugs. You can get a pack of 6 for only $3.76 on Amazon! These are also great ones to use for swimming if your ears bother you underwater. 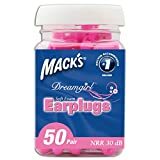 Mack’s Dreamgirl Soft Foam Earplugs These are what I use most often and they work great. I like that you can throw them out after one use and not worry about losing them on the plane. 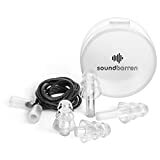 SoundBarren Reusable Earplugs with Case and Optional Cord If you are looking for something you can reuse then these are very highly rated on Amazon. These earplugs are made of hypoallergenic, non-toxic silicone, so you don’t have to worry about the pain or itchiness some earplugs can cause. The unique design also helps them stay in overnight, perfect for getting some sleep on long haul flights. Luggage – This Osprey carry-on roller bag & backpack literally has it all! My favorite part is that it has a backpack that you can detach once you get on the plane, allowing you to basically pack an extra “personal item” to store under your seat (which I clearly need since I bring 3 books and a 40 ounce water bottle with me on a 2.5 hour flight, haha). It was one of those things that you didn’t know you needed, until you have it. It’s expensive, but it is really worth it if you do a decent amount of traveling. Camera bag as my official personal item. So now over to you. What are your airplane essentials you can’t travel without? If you enjoyed this post don’t forget to share it and check out some more of our best travel tip here.